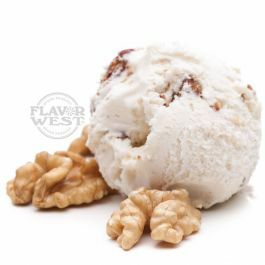 Smooth and creamy butter pecans flavor delights your treats. Butter pecan flavor offers a distinct rich aroma and a delicious taste in your favorite treats. Type: Butter Pecan Water Soluble Flavoring. Ingredients: Natural and Artificial Flavoring, Propylene Glycol. USP Kosher Grade Flavoring. Usage Rate: 15-20% for E-use. Flavor suitability: Suitable cakes, yogurt, ice cream, pudding, coffee, tea, cream, and much more. Specific Gravity: 1.05 No Refunds on Flavoring. Ridiculously smooth flavor. Takes about a week to mix properly. Works well standalone or with many vanilla, cake, or nut flavors. I have been focused on 'baked goods' flavors for years. This is more of a smooth baked cake than a nutty flavor. I find the balance to be nearly perfect. It's characteristics make it well suited to mixing to flavors that need a bit of neutralizing.